I speak rather highly of my home in the South East of London, but if I am being totally honest, I realise it's not all I paint it to be. Don't get me wrong, the immediate vicinity to where I live is great and I feel totally safe (most of the time). But this trust has been earned over many years of living here and I would be an idiot if I didn’t realise that some of the associated prejudices of the South East are probably true. Only last week, a 15 year old school kid was stabbed on his way to school (thankfully, he lived). When I was invited for a meetup of some South East London based Tweeters in Blackheath, I immediately had the preconception that it wouldn’t be very nice. I saw dark alleys, broken lamps and burning cars. How wrong I was. Blackheath is actually bloody lovely. And not only is it lovely, but it has a rather good Italian restaurant called Bella Vista which was the destination for our little meetup. 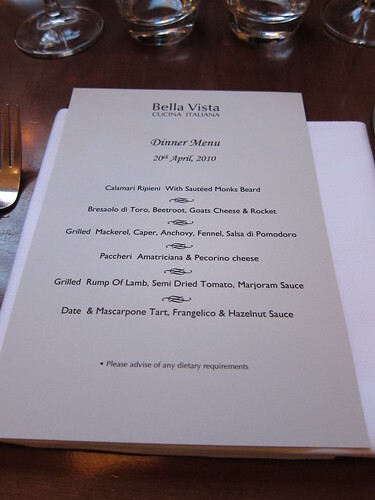 Bella Vista has been in Blackheath for quite some time, but it has only been since January that Alex Tyndall took over as the head chef. He has some pretty decent pedigree (having worked for Michelin starred Chapter One in Kent) and had kindly prepared for us a special menu to show off some of his repertoire of dishes. As well as a gaggle of tweeters, Ben from Enotria UK came along for the ride and kindly prepared a matching wine flight to complement the meal. I’m not going to go into the wine, as I am a total wine cretin and have literally zero idea of what I am talking about, but head on over HERE and you will find my photos of the night with the pics of the wines in all their beauty. The food, on the other hand, I am more at ease with. 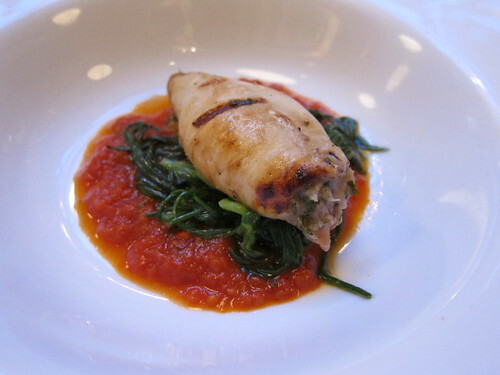 The first dish of stuffed squid, for example, was excellent. Tangy tomato sauce, an earthy bitterness from the monks beard (a vegetable I had never come across before) and the squid itself stuffed with its own tentacles and perfectly cooked to a soft bite. With a meaty interlude of bresaolo, the next dish was a real challenge for me. 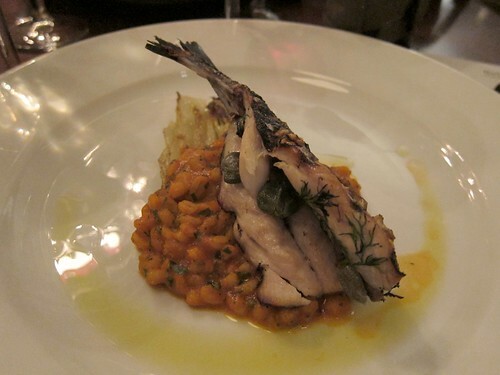 A filleted mackerel stuffed with capers and anchovies were sat on top of a bulghur wheat “salsa”. Mackerel AND anchovies?? I puffed my chest out and took a bite. And another. And another. Eventually, the whole thing was gone. It was absolutely delicious and it was quite surprising how well this went down. The anchovy element was not overpowering and the fish must have been extremely fresh as it had no trace of that "fishy" taste I normally associate with oily fish such as this. A very pleasant surprise. The fish was followed by a well executed pasta dish comprising of a few oversized penne (aka paccheri) sitting in a sweet and tangy tomato sauce, smothered in tonnes of stinky pecorino. The meat course of lamb, tomato and marjoram was sadly the lowlight of the meal for me. The lamb was exceptionally cooked and returned good flavour but was woefully underseasoned. The white bean puree that it sat on didn't help with the dish and just made everything taste even more bland. It was disappointing, although the dessert that followed certainly did not. 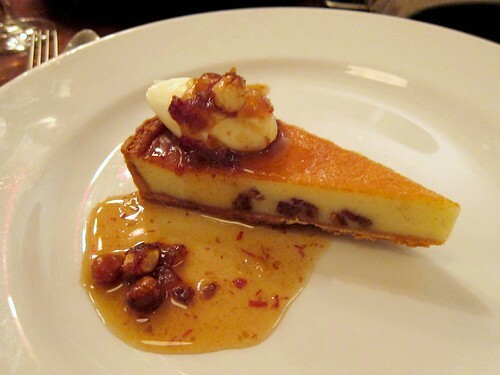 Date and mascarpone tart was light and not overly sweet. The frangelico and hazelnut syrup added moisture and a change in texture. We were so full by this stage but our plates returned to the kitchen scraped clean. Like I mentioned earlier, I am a bit rubbish with wine, but even I enjoyed the wine matched to the courses and I can genuinely say I learnt a little and enjoyed wine a tiny bit more. The food was excellent and as good an excuse as any to travel into the depths of South East London. I met a few more people from the #SEmassive as well as having a good laugh with a few of the ones I had already met. Great night, great food and great people. Thanks to Rob Macintosh, big daddy of the SE Massive for organising and long live South East London! My very good friend @leeturnerconn lives in Blackheath and we tried to get into Bella Vista the other weekend but failed. Thanks for your post though because I will make sure we do get in at some point! Thanks for the mention and a great review. Glad you enjoyed the restaurant and hopefully we're helping more to "brave" the trip South East for decent food and lifestyle. Now, we just need more wine destinations! It is a shame you couldn't say more about the wine (even if it was just like/dislike) as it helps encourage others, and I seem to recall you were making some very good observations on the night. Why not just compare wine to food? Look forward to the next #SEMassive gathering. Any suggestions? You ate mackerel and anchovies....??!! I take my hat off to you! Looks like a lovely meal - a real shame I had to miss out. Hope to join you all for the next SE Massive outing! I REALLY love the look of that stuffed squid. My boyfriend's Greek mama also makes a great one, but as she's in Australia, Blackheath might be more convenient for you. I had my 16th birthday dinner in Bella Vista, Blackheath. Factoid. @Krista - I would definitely try. The chef has good pedigree and trying to make his mark. His food is also good, which helps! @GD - I think it was probably my favourite dish. So well cooked and delicious.